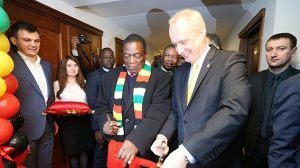 Commercial, political and cultural ties between Zimbabwe and Belarus have received a major boost following President Mnangagwa’s opening of an Honorary Consul in central Minsk this morning. The occasion preceded a meeting between President Mnangagwa and President Lukashenko at the Presidential Palace in the Belarussian capital. Presidents Mnangagwa and Lukashenko then went into closed door talks, with both sides optimistic the engagement would result in the signing of several agreements. Earlier, prominent businessman Mr Aleksandr Zingman, who has been pushing for stronger Zimbabwe-Belarus relations in recent years, was presented as Honorary Consul. After cutting the ceremonial ribbon at the entrance and touring the offices, President Mnangagwa said, “I am pleased we have opened our consul here in the Republic of Belarus, and we appointed Aleks the Honorary Consul of Zimbabwe. Zimbabwe and Belarus already have memoranda of understanding that cover mining, science, technology and innovation; trade and economic co-operation; procurement of agri-equipment; and fertiliser supply. President Mnangagwa has secured a US$120 million export credit line for the supply of machinery and equipment for agriculture, dam construction and mining; and it is hoped that today’s talks will build on this. Equipment from Belarus has boosted Hwange Colliery’s monthly output from 50 000 tonnes to 250 000; and that of the Zimbabwe Mining Development Company to 40 000 carats of diamonds. Indications are that today the two Presidents could discuss higher, tertiary and vocational education; establishment of a Joint Committee on Trade and Economic Co-operation; extradition; and greater collaboration in agriculture, among other areas of mutual concern. The leaders could likely announce whatever they agree as soon as pen is put to paper, after which President Lukashenko will host an official lunch in honour of the Head of State and Government and Commander-in-Chief of the Zimbabwe Defence Forces.